Bertrand Parvaud, the coach of Ligue Féminine 2 side Etoile de Voiron (The Voiron stars), lived up to his nickname "Zorro" by announcing his 2011-2012 roster within a week of the official close of the previous season. Voiron's tradition of promoting players from their youth academy into the first team continues with the addition of Olivia Canoin (20) and Cassandre Blanchon. However this did not stop the club from recruiting three French players under the age of 23: former CFBB player and USO Mondeville Espoir player Johanna Joseph. Point guard Laure Mercier comes from the CFBB while Magali Mendy (21) continues her tour of France after playing in Reims and Pleyber-Christ. With the departure of Nadja Morgan, the club's big signing of the summer is Amanda Lassiter. Lassiter played in the WNBA between 2001-2006. In 2007 she was waived by Chicago and then made her first venture into Europe. She has played for two clubs in Germany's top division. Lassiter spent a season playing in the Spanish second division. Last year she played for Kotka Peli-Karhut, Finland. The final signing is Mina Maksimovic from Serbia. Unfortunately she injured herself during pre-season. According to recent information she should be out for some time. As a consequence the club has signed a medical replacement (joker medical) Ivona Jerkovi. The players coming back for the second season of Ligue Féminine 2are: Cyrielle Recoura, Mélanie Venier, Khadidiatou Gassama, Julianne Anchling, Faeza Bouderra (in picture). 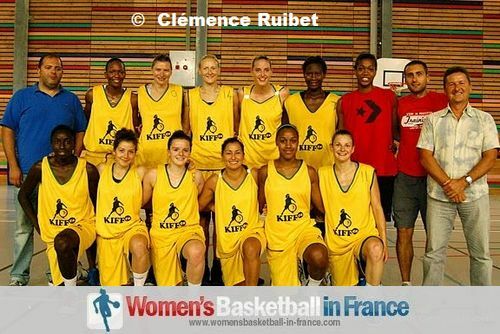 The players that left are: Kathleen Bourdin (Basket Club Saint Paul Rezé - NF1), Charlotte Plumère, Nadja Morgan (Roche Vendée - LFB), Stéphanie Pognon, Rasa Zemantauskaité (Pau Lacq Orthez - NF1). Gloria N'Tonta's future has not been communicated. She was injured last season and replaced by Bouderra.